Whoohooo, the results are in and it’s good! I can’t tell you how sick I felt today going to the hospital. Why? I should be used to it by now. … shouldn’t I? The anxiety levels were through the roof as I tried to find a parking space in the car park. As I was cutting it fine, arriving only a minute before my appointment time, I decided to only buy 1 hours car parking (at a mere cost of £2.20/hr). Rushing across the lengthy car park and nearly coming a cropper as I missed a pavement, I rather launched myself into the clinic! After checking in, I settled down and waited. And waited. I realised though that actually I’d been spending far less time in this particular clinic of late… well there were magazines I’d not read, so that’s got to be a good sign. Right? 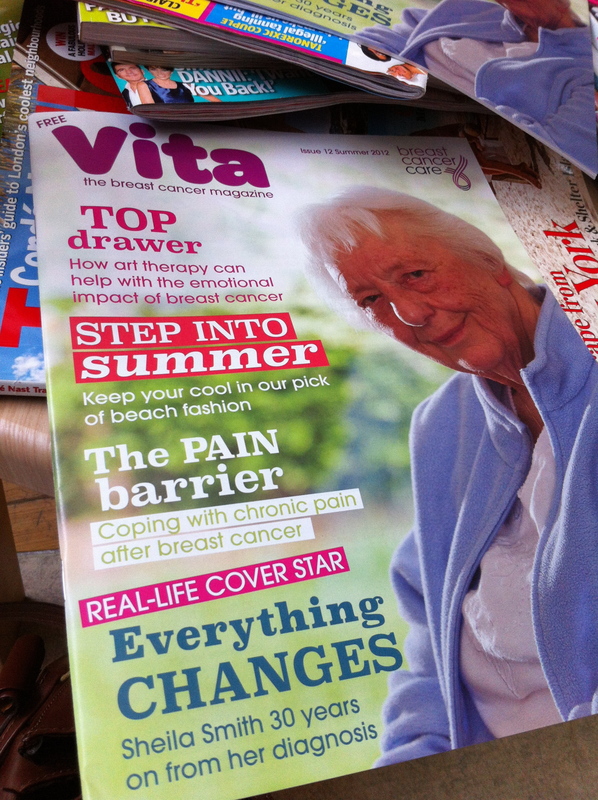 They even had the latest Vita, which is a magazine produced by Breast Cancer Care and a wonderful source of information and support for anyone with primary or secondary breast cancer (and their carers). I was also super-chuffed that there was an article about David Jay and The Scar Project. Love that project and am so honoured to have known Jolene and others who have taken part and shared their journey through the images. Incredible. After an hour, I rushed out to put more money in for another hour parking…. And of course half way across the car park the heavens opened! Anyway I think the trip to the car and my attempts at mathematics helped me get some perspective about my appointment. It wasn’t long afterward that I was called in to see the consultant and get my results. I was shown into the ‘good room’ (ie not the room of doom), which helps enormously. A few minutes later, my consultant appeared with a smiley face and welcomed me warmly. Seriously, if there are any medics reading this, you could really learn from this man – how much easier is an appointment and our anxiety levels when someone is genuinely warm and welcoming? We had our usual little chat, he told me I was looking well (another point for the medics!). Although to be fair, I’ve also learnt that I need to make the effort when I’m anxious.. always matching underwear, shoes, nails, hair done and make up applied. We then talked some more about Phyllodes, what it is, what I’d learnt, what he’s learnt and what he’s telling his trainees. It’s always so encouraging to think that by my diagnosis and it being weird and rare, he’s taken that (and with my encouragement) and ensuring that there are going to be some medics of the future that know a little bit about it. I always hope that they get eager to learn more. Next the manual examination. Once again I could commend him on his surgical handywork. The scar tissue is getting less and the excision site becoming more even. We talked about ‘evening up’ by surgery and it’s good to know the offer is there and he’d do a fabulous job… but I’m not ready for surgery again anytime soon. Then I broached the ‘difficult subject’. As you will all know from reading my blog, I can’t be any happier with the way my consultant has looked after me, managed my case and helped me through this, supporting me every step of the way. However there have been the blips with the radiography department where they don’t necessarily understand about Phyllodes nor feel checks are necessary (or as has been mentioned “it’s not as if you’ve got breast cancer”!). Anyway, the bottom line is that as someone diagnosed with Phyllodes, a rare soft tissue sarcoma, my case should have been referred to a sarcoma specialist to manage. However I’ve always been more than a little anxious to leave the fabulous care of my consultant. I still am. But today I asked him if I could be referred to the Royal Marsden in London for my follow up regimen. I explained why I thought it was important to be with a sarcoma team and also a team that I know have other Phyllodes patients and understand them and the best treatment etc. I also told him that I was sorry I couldn’t still be seen by him sometimes! It does seem right though that I move on and my place in the breast cancer unit is indeed filled with a breast cancer patient. He’s a truly wonderful consultant and surgeon and whoever fills my slot in his busy schedule is indeed a very fortunate person. He agreed that this was probably the best thing. However has said that if ever I’m worried or he can help in anyway, then to give him a call. As I left, he put his hand out to shake mine and then laughed and said he felt it more appropriate to give me a hug! On the way home in the car I shed a tear or two. I’m not sure if it’s because I’m scared if I’ve done the right thing. Am I leaving someone who I knows cares about my wellbeing and health and stepping into the unknown or am I leaving him but going to a more specialist unit that will be able to add Phyllodes expertise as well as care? I hope I’ve done the right thing. Phew, so please for you. And yes I think it’s a good thing to go to the Royal Marsden. I can understand your concern, leaving your very trustworthy consultant, but they are the experts at the Royal Marsden – you will be in good hands. So many medics know so little about PT, it will be a relief to be around some who do and you should get the best care because of it. Thanks. I know it does make sense but v scary leaving my lovely consultant and entering the ‘relatively’ unknown! I think they often don’t get “feedback” like this so it would probably make his day, and hopefully encourage him in his good practices.